Earlier this week, GoDaddy made a pretty big change to its Offer/Counter Offer (OCO) pages for domain names listed for sale via GoDaddy Auctions. The new landing pages have more details about the domain name listings and share information about its appraised value and comparable sales. Of note, listings with Buy It Now prices were not updated with the new landing page design. The objective of the redesigned landing page is to give prospective buyers more information to make a data-driven purchase decision. I was also told the company overhauled the backend for these OCO listings (new APIs and moving to cloud) for better performance. GoDaddy is planning to launch the mobile version of the redesign by the beginning of April. GoDaddy’s Investor app does not currently support OCO inventory, but once the mobile version is released in April, app users will be able to watch and place offers for OCO inventory via the app. I know some people might not like the idea of having comparable sales and appraisal information on these landing pages. I am sure the company will be monitoring results, and if the landing pages don’t produce a positive result, they will likely be changed. I am sure GoDaddy would be happy to hear your thoughts on the redesigned OCO pages. i think the biggest improvement would be to more fully explain that ending date. the ending date for offer counter offer is not and ENDING date like an expired name auction. its just they are forcing a perpetual renewed listing into the auction platform, economies of scale, yadda yadda.. but buyers see it are not inclined to act, auction takes awhile or the thought is why increase my bid, if im the highest when the auction ends i get the name? The biggest improvement for Godaddy Auctions would be if they stopped auctioning domains without owners’ consent. You consent via UTOS when you register a domain. 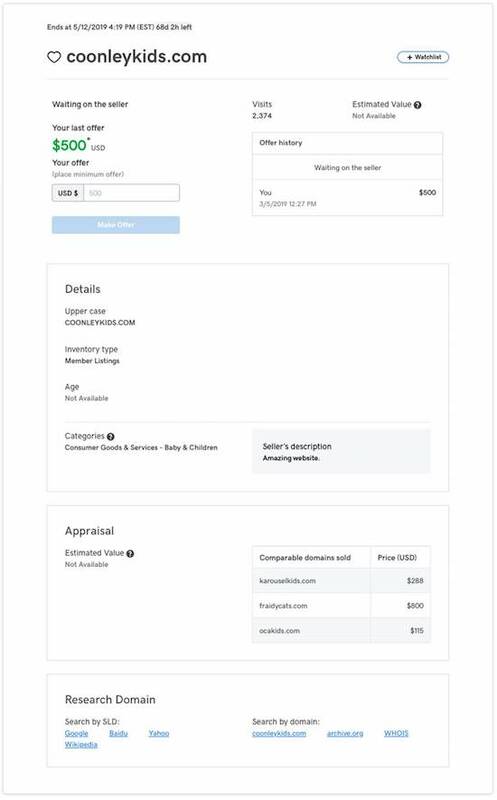 With GoDaddy having purchased many aftermarket domains for resale I think they’re shooting themselves in the foot with the appraisal tool which is simply invalid, in my opinion, and lessens the amount many buyers would otherwise pay for a domain. You can’t appraise a domain like a house because a house will only be purchased by one type of customer whereas a domain may be wanted by an individual for personal use, a small business, or a large corporation as the centerpiece of major advertising. Godaddy getting into the automated domain apprasal game is possibly the biggest negative thing that has happened to domain investors in the last couple of years. It is an extremely flawed market manipulation to benefits thr markeplace only with sales volume, and devalues the actual market. Yes, it is the biggest negative. I’ve had so many reference it and often results in loss of a sale. Totally agree with you Rod. It is a dangerous unverfied tool, and a few end users have used it against me. The scary thing is the newbies who think they are paying $200 for a domain worth $1,500, like they actually believe this like it has some merit. I would advise everyone to use it against godaddy when buying one of their domains, and wait for their answer. Perhaps GoDaddy’s experience with the appraisal on auctions and POS (via registry stream) makes the company believe adding an appraisal and comparable sales data will be helpful. Regardless, it is implemented now so sellers need to be aware. I don’t really like it, not that the old style is much better. It’s cleaner looking, but that’s about it. I am definitely not liking the Value & Appraisal tool and comparable sales being added. End-users and brokers use that against domain sellers. It should be our choice if we want the Value & Appraisal tool and comparable sales in our domain listings, seeing that it is OUR DOMAIN. Most of my GoDaddy Auctions lisitngs are BIN/Make Offer, which the layout has not changed yet and hopfully won’t! But GoDaddy doesn’t really care about what most domainers think, only a select few of YOU. I like the idea of providing sales comps. I display sales comps, which I have researched by hand, on our sales pages. As we are selling virtual real estate, I do believe that this can be helpful in pricing domain names and in supporting listing prices. I don’t believe that computer generated sales comps offer the same value. In addition, I have found that computer generated appraisals are often highly inaccurate. Imho, it would behoove GoDaddy, and their customers, if they allowed sellers to opt out of displaying either or both. I also agree with Page that the “Ending Date” can be extremely confusing to buyers. It is hard to figure out what that means with regard to “BIN” listings. It is also rather misinformative with regard to “Make Offer” listings as offers typically expire well before the ending date. One who is unfamiliar with their platform might assume that their offer would be binding until the ending date, before even attempting to make an offer. Thank you for keeping us up to date Elliot! I agree with you and Page about domain auction end dates. Need some clarity for buyers. I contacted GD to ask if there is a way to opt-out. There is not. I don’t really want automated appraisals or “comps” to be listed on my sale listings. It can really box you in when it comes to pricing and often gives a potential buyer unrealistic expectations. There needs to be a way to opt-out. We want “OPT-OUT” option, Joe and Paul! One quick and easy fix would be for GoDaddy to change the terminology from “Auction Ends” or “Ends at” to “Offer Expires” with a footnote that “Pricing and availability can change.” This might also serve as a call to action. Do you know how many end users wait 90 days, and the last 5 minutes to bid? It simply just slows down your sales which such wording. Year, after year I have dealt with these same inquiries. Everyone knows it’s an issue, but nobody cares to fix it. Exactly! End-users think GoDaddy Auctions domain auctions work like eBay auctions or any other normal auction marketplace. You are correct Mark. Some will wait till the last 5 minutes to bid. It’s also very likely that some will simply walk away, never to be heard from again. It would clearly eliminate the confusion if they hid the time clock from all BIN, Make Offer and Make offer or BIN listings… Less confusion if they simply improve the verbiage. They wait so they don’t get sniped. Have landed plenty by waiting for closeout where others would have picked them up if I put in bids. Not all domains showing this new offer page. Maybe they are processing it through batches. My following domains AroChemicals.com and HomieGames.com are not showing new offer pages. Do you have BIN prices listed for your names? If so, the new landing page will not show. It is only for offer/counteroffer pages. Yet another good reason to simply use BIN pricing and landing pages at GoDaddy.